Hawaii Delight is the perfect online store to visit if you are looking to purchase the most unique Hawaiian treasures. All of the products that are listed for sale at HawaiiDelight.com are crafted by local artisans and are grown on Hawaii's most nutrient soil. We welcome you to visit the site and select an item to experience a taste of our Hawaiian culture. Premium eGoods providers our customers with a diverse inventory, providing them with the highest quality. We have pulled together an assortment of items to cater to our customers every need. Our customers can purchase anything from accessories, jewelry, home decor, all the way to camping supplies. At ﻿PremiumeGoods.com we believe that you will be able to find all that your heart desires. The Ninja Sock is a brilliantly designed sock that helps to eliminate bacteria causing foot odor and provides the foot with extra support through the advanced disk strategically placed at the ball of the foot. The Ninja Sock design allows you to walk, run, sprint, at you best ability. Your perfect skin is just a dream away! 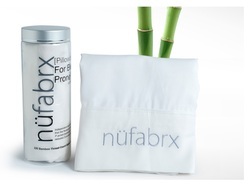 The Nufabrx Pillowcase is the world's latest invention to fight and eliminate acne causing bacteria. Our Nufabrx Pillowcase is handcrafted from the finest bamboo fibers and infused with natural skin remedies to create a spa-quality, anti-microbial, hypoallergenic pillowcase. Innovative microencapsulation technology allows our all natural scientifically formulated serum containing lavender, lemon balm, tea tree oil and wintergreen oil to remain embedded within the fibers of the pillowcase wash after wash. The perfect amount of our proprietary natural serum is slowly released nightly, keeping your skin fresh and clean. In a study, tea tree oil was shown to be nearly as effective as 5% Benzoyl Peroxide. In another independent study, Nufabrx Pillowcase was shown to reduce the bacteria P. acnes by 91.5% over a 24-hour period. These are the perfect gift for anyone that you love. Living in a high tech world we are always looking for more gigabyte storage. These beautifully crafted USB drives are multi-purpose, meaning you can wear them as a necklace charm, place it on your key ring or cellphone and decoration and even as dangling earrings. 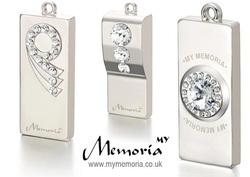 Each My Memoria can be ordered in either 18 Kt Gold or Platinum, and includes a variety of Swarovski crystals in each design.